As tough as getting into law school is, navigating the maze of social and academic requirements to make the most of a legal education can be even more difficult. Law School Labyrinth will guide students through law school from orientation to graduation and beyond. Law School Labyrinth is designed to help law students maximize their law school experience by offering essential strategies for success. Author Steven Sedberry, who left a 20-year big business career to pursue his law degree, provides a unique perspective on maximizing the law school experience and a no-nonsense approach to planning for the future. By following his "been there, done that" advice, students will learn how to read legal opinions, participate in Socratic dialogue, and assimilate and retain information necessary to succeed on law school exams. Going beyond the classroom, Law School Labyrinth provides information on summer clerkships and career advice. 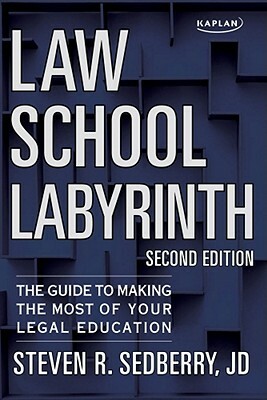 Fully updated and revised, Law School Labyrinth is the consummate road map for maneuvering law school. Steve Sedberry, Esq., received his Doctorate of Jurisprudence from Vanderbilt University Law School and his Bachelor of Business Administration from the University of Texas at Austin. Steve entered law school following a twenty-year career in industry. He is licensed in Texas and Tennessee, and is also admitted to the United States District Courts for the Eastern District of Texas and the Western District of Tennessee. Steve is a member of the American Bar Association and the Association of Corporate Counsel.